Santa Claus and his friends began the Christmas Season in San Gabriel with the Annual Tree Lighting Ceremony held in Plaza Park on December 1. Students from Jefferson Middle School provided the entertainment. 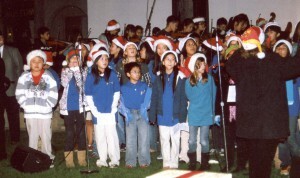 Christmas carols filled the night air under a full moon. 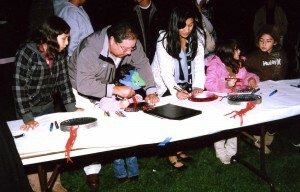 Children of all ages decorated the traditions pie plate ornaments that were hung on the smaller trees in the park. The silver background was painted with various color markers by the artists. Residents enjoyed traditional Mexican sweetbread and hot cocoa as they waited for the tree to be lit up and for Santa Claus. Mayor Juli Costanzo welcomed everyone to this Tree Lighting Ceremony. She asked the residents to please remember our troops this holiday season. 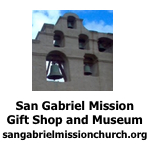 She called San Gabriel a special community where people help each other. She asked residents to give from your heart. Mayor Costanzo introduced Vice Mayor Albert Huang, Councilmembers Mario De La Torre, Dave Gutierrez and Kevin Sawkins, City Clerk Ellie Andrews, City Treasurer John Janosik, City Attorney Bob Kress, Administrator Cindy Smith, Director of Parks and Recreation Rebecca Perez, Mission Playhouse Director Anna Cross, Police Chief Dave Lawton, Fire Chief Joe Nestor, Director of Finance Thomas Marston, Interim City Manager Steve Preston, Chamber of Commerce President Lou Costanzo, Cookie Sisi from the Women’s Division of the Chamber and members of the San Gabriel School Board and the Parks and Recreation Commission. Mayor Costanzo thanked the school district and students for today’s entertainment and the playhouse staff for the sound system. The crowd joined the mayor in singing “Silent Night” and helped her count backwards from five to one to light up the beautiful old pine tree in the park. It was decorated with large ornaments and colorful lights. The residents are very proud on this tradition. Then the sounds of sirens filled the air as the guest of honor arrived on an antique fire truck. Santa Claus and two of his elves arrived to visit with all the good boys and girls. 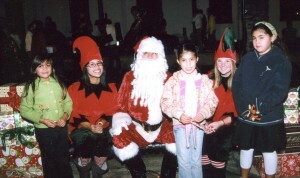 Each child had a chance to visit with Santa and receive a candy cane. Mayor Costanzo wished everyone Happy Holidays and Merry Christmas. Be safe!